The company was Electronic Arts. Since those times, the world has changed. EA does’t look much like it did in the early days. Today, it is a company for better or worse not about enabling new forms of software artistry but rather pumping and scaling proven models of gameplay to as mainstream of an audience as possible. 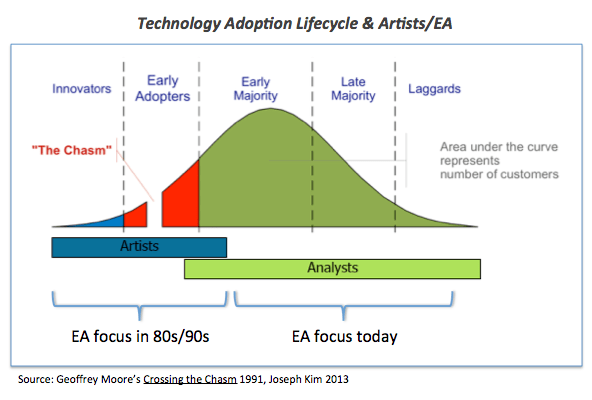 If we think in terms of Geoffrey Moore/The McKenna Group’s technology adoption lifecycle framework, we can view artists as typically early phase (Innovators and Early Adopters group) contributors for new models/forms of gameplay, and analysts (the guys who focus on incremental improvements) as typically mid to late phase (Early Majority, Late Majority, and Laggards group) contributors. In these terms, EA has shifted its focus from enabling/marketing/distributing for artists to analysts. The next logical question to ask for folks in our industry is the following: Is there an artist enabler (the early version of EA) for the mobile gaming industry? EA itself has been taking more of a “console” and horizontal approach to the mobile medium with high production value, large footprint, console-like mobile games (e.g., Real Racing, FIFA, Mass Effect: Infiltrator) or branded casual “me too” games (e.g., Tetris Blitz, The Simpsons: Tapped Out, The Sims, etc.). As for other companies, I would submit to you that every single major publisher does not support artists in this space well and it’s not even close. Yet today, more than ever the needs of the software artist are greater than they have ever been. Why? Let’s take a step back for a moment and get a better understanding of some key nuance required to understand what it means to enable and market for software artists in mobile gaming. #1. Discovery is Screwed Up: The App Store and Google Play are pretty broken. User app discovery in mobile is most similar to that of a single station radio industry. Both Apple and Google continue to play King makers as they feature (fairly or unfairly) and drive users to a small fraction of mobile apps while the rest of the industry must fight for user attention. Implication: With very few channels to effectively market apps to users, app developers are forced to use very expensive and often non-transparent sources to acquire users for their applications. Dealing with and managing discovery/user acquisition isn’t easy nor very well understood even by so called experts in our industry much less typical artists (usually not super business savvy). Implication 1: User app discovery will go to those companies who can pay the most for it. Hence, large, well resourced companies could (and do) unprofitably acquire users creating artificially high barriers for independent game developers to be able to achieve profitability. Implication 2: Artificially high user acquisition costs completely kill off certain types of mobile games. For example, almost all casual games have been getting killed off (obviously with some exception such as Candy Crush Saga or Subway Surfers) and the industry must favor the survival of higher LTV games. Hence the industry shift to mid-core/hard-core. #3. Mobile Games are a Service: Mobile F2P games make money delivering a relatively unfinished product which in many cases makes most of its money through live ops/events. In fact, GREE has been rumored to have doubled the monetization of some of their RPG games like Modern War this past February by: 1. Implementing events (a live service) and 2. incrementally improving the game design by adding card battle GVG (guild vs. guild) game mechanics. Implication: The expertise in running events/live ops and keeping up to date with the latest most effective mechanics is an analyst not artist type function. This extremely valuable function which can make the difference between profitability or failure requires specific knowledge and expertise not typically found in artist types. #4. The Industry is Very Complex: The fast moving nature of the industry and the diverse and specific knowledge required creates a level of complexity that is hard to find in a single small organization. Much less an artist organization. Implication: In such a challenging and competitive industry like mobile, the complexity involved can be daunting and key differentiators or drivers for success can be hard to understand without some guidance or inside information. #5. Success Requires a Diverse Skill-set: The typical artist or artist organization does not typically have the savvy quant/business/analyst types of people that understands all of the other things besides the great game idea to achieve success. Mobile requires skills in so many areas e.g., user acquisition/distribution, distribution/social platforms, game design, mobile specific UI/UX, mobile monetization and retention tactics, QA, mobile tech limitations, mobile specific analytics, social integration and tactics, community service, events, live ops, etc. Implication: Self publishing a product that has 95% of what is required for success isn’t good enough. That small missing piece may make all of the difference. I believe that a company enabling software artists can and will emerge. 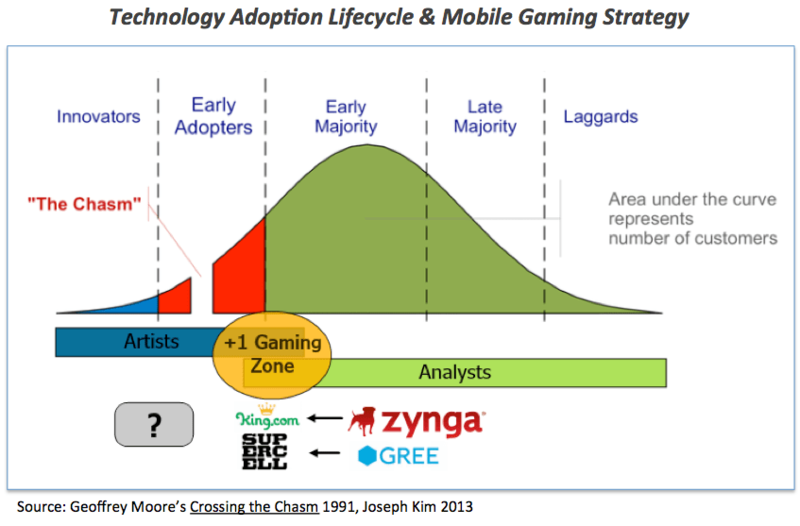 The model of success right now from a publisher perspective is to sit in the “+1 Gaming Zone.” Companies realize this as we see companies like Zynga and GREE moving in this direction (finally!). Having said that, I believe that there will be more and “better” hits that come from artist created >+1 models emerge and the opportunity is ripe for someone in our industry to enable these hits. Required Services: Besides the core game, there is a fairly diverse set of services required by a software artist enabling organization to help enable success. Unlike in the old console/PC game days, there is much more required than just distribution and getting retail shelf space. 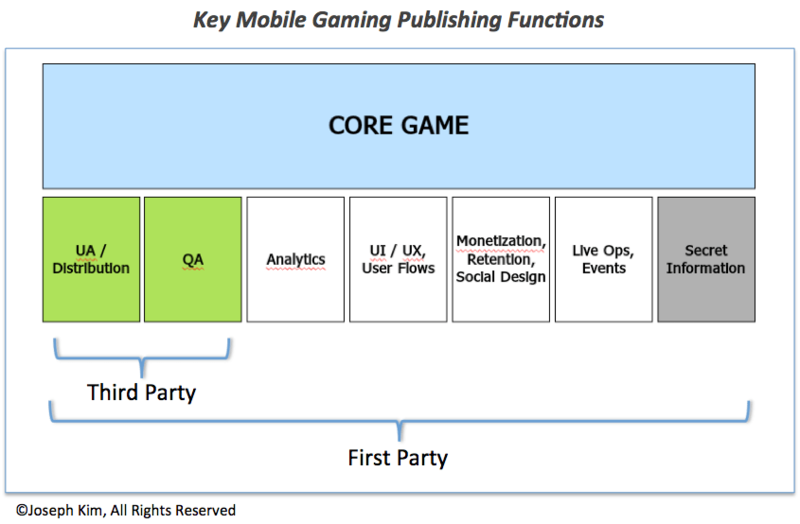 1st Party vs. 3rd Party: Large mobile publishers today have a model of typically sharing only the distribution and QA function with third party developers but a lot of the useful central services functions are reserved for only first party titles. This creates a conflict for publishers who are unwilling to share all of the necessary components for success externally. What’s really needed is a sophisticated and efficient Central Services organization that provides the full stack of services and helps artists take the next step of “crossing the chasm” to commercial success. Trip Hawkins states in his interview that “software is an artform.” I wholeheartedly agree and hope to see some organization emerge that protects and enables new artforms in our industry. The alternative is what we have today: an industry pumping out yet another 50 card battle games, Clash of Clans clones, and CSR Racing clones. Today, the environment is bleak for software artists in mobile but I do believe we will soon see a new kind of publisher develop that will enable the emergence of software artists just as the console and PC industries were enabled back in their days. 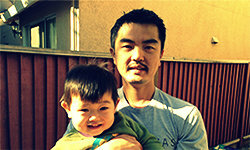 Who will be the new old Electronic Arts for the mobile gaming industry? I could not agree more, what an excellent diagnosis of our “loved and complex” industry. Just read “Buyology” book by Martin Lindstrom to try understand consumers’ mind a bit more. I didn’t 😉 but it’s a great book. Fantastic points you make on mobile games. Great analysis. Great article, and some amazing vintage footage that came with it. Well done.